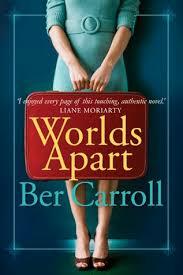 It’s my very great pleasure to welcome Ber Carroll to my conversation series! As many of my regular readers will know, Ber and I – along with our third musketeer, Liane Moriarty – write a joint newsletter, BookChat, and speak together at author events. We met through our mutual publisher several years ago after we had both commented to her that we’d really like to network with other authors – particularly other women’s fiction authors. Our publisher put us in touch with each other, then I invited Liane to join us, and we’ve been going strong ever since. We all support one another, listen, share our highs and lows, and I know I can speak for Liane when I say that we were both impatiently waiting for Ber’s new novel, Worlds Apart. So tell me this, Ber – what took you so long?! First of all, I want to thank my readers for their patience. Three years is a long time between drinks (especially if you’re Irish, like me!). Some stories just take longer to write, and this one has been percolating for a while, maybe even since I first arrived in Sydney almost twenty years ago. Straight away I felt as though I belonged here, in Sydney, and ever since I have found myself watching others, migrants like me, and wondering if they feel that same sense of belonging, or if they feel like they belong somewhere else. Many of the characters in Worlds Apart are foreigners, foreign to Sydney, or foreign to Dublin, or foreign in some other less obvious way. It look a while to weave a story around these characters. All the minor characters came first: Fila, Lisha, Kasia. Then followed Erin, Laura, Cathy and Moira, who were more complex to write, and whose individual feelings of being ‘out of place’ have nothing to do with nationality. That is fascinating. I had a similar experience when I moved up to an inner city suburb of Sydney a couple of years ago. I know that's a much less dramatic move, but after living in the same town for twenty-four years, raising my kids, I was a little terrified about such a big move. But I totally relate to the 'sense of belonging' that you talk about. It was unexpected and very powerful.So needless to say, I loved Erin's storyline. But before we go on to the main characters, I'm interested that you came up with the so-called minor characters first. I say ‘so-called’ because they all have a significant role to play in Worlds Apart, and they each have such interesting back stories. Are any of them based on people you know? How did you come up with them? Well, I learned after my first novel not to base characters on real people! Having said that, Kasia is loosely based on a Polish girl who used to nanny for a friend of mine. My friend couldn’t warm to her, and I remember wondering (while listening to recounts of everything this poor nanny was supposedly doing wrong) what the nanny actually thought of my friend. Fila is based on all the young Afghan girls in Australia, who are every day striving to learn our language and our culture. Lisha, similarly, is based on all the Nigerian girls in Ireland, struggling to fit in and make a new life. The reason that letters and emails are used periodically throughout the novel is to give these minor characters a voice. I loved the letters and emails throughout Worlds Apart - they give such a warm and personal insight into the characters.You've admitted to relating quite closely to Erin, so what about her cousin, Laura, the other central character driving the narrative? I actually think a lot of readers will relate to Laura - the stressed, overworked, overtired woman juggling a demanding career with being a wife and mother. But I daresay the reader will also see how Laura's control freakery is only making things harder for herself. Tell the truth now, Ber - have you ever been found scrubbing your shower recess in the middle of the night? Actually, my house is such a terrible mess by the time I finish a novel that some midnight scrubbing wouldn’t go astray! Going back to Laura, yes, I hope a lot of women can relate to her – I certainly can. The constant juggling, the persistent feeling that you aren’t doing the right thing by either your family or your work, is something I have experienced firsthand, especially when I worked in the corporate world and had less flexibility with my hours. At certain points in the novel, my writing of Laura’s struggles were a little too heartfelt, and the editor had to ask me to ease off a bit. That's interesting, Ber. Well, you still certainly managed to convey Laura's stress levels extremely well - I felt exhausted reading some of her sections, I just wanted to tell her to slow down and relax! That's why I enjoyed her scenes with Moira so much. What a lovely character Moira is - you have given us such an empathetic portrayal of a person slipping into dementia. Where did you get the idea for Moira? Moira is the combination of many stories I have heard over the years from family and friends who have loved ones with similar illnesses. I was struck by how many times these stories were relayed with a smile, and how much tenderness there was beneath the sadness. As an author, I enjoyed writing Moira immensely. She’s warm, funny, very lovable, and a strange mix of wise and child-like. More than anything, she is totally unpredictable . . . I love writing those unexpected characters too – it’s like having a visit with a lovely friend. And I think that’s how readers will feel about Worlds Apart, Ber – like they’re sitting down for a visit with a range of interesting characters, either in Sydney, or across the world in Ireland!And let’s not forget the male characters! The three leading men - Jack, Adam and Esteban - were all very appealing in very different ways. What was your inspiration for these characters? I have to admit, Di, that after six novels I find it quite hard to come up with new male characters. The truth is that Jack, Adam and Esteban came about after lots and lots of contemplation and scratching around for ideas. Jack is Erin’s perfect man, even though he comes with a certain degree of baggage (specifically, two wary daughters). Adam – hyperactive, passionate, quirky – is her friend and boss. As the story progresses, Erin has to make a choice between these two very different men (lucky Erin!). Esteban is Laura’s husband, and yet another foreigner. But Esteban is quite well established: into Dublin, into Laura’s family, and into Irish life. I like how Esteban provides an exotic element to a very Irish family. And I like how he breaks stereotype. Actually, as I write this I’m realising that I’m very happy with how the male characters turned out. Maybe all that contemplation paid off! Indeed! Thanks so much for giving us this extra insight into Worlds Apart, Ber.